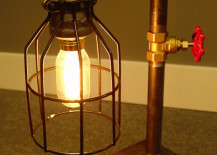 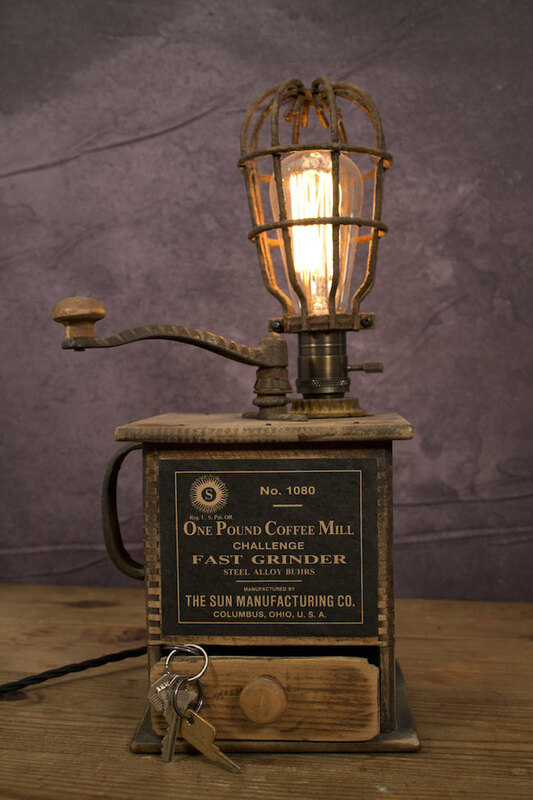 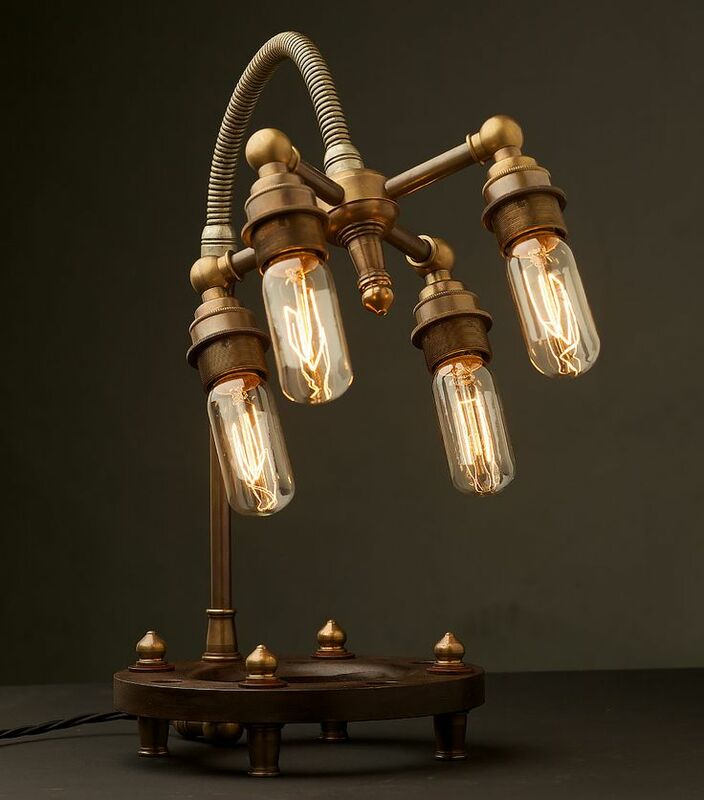 If you’re looking for a table or desk lamp that’s truly out of the ordinary and anything but bland, look no further than the industrial style, or steampunk trend! 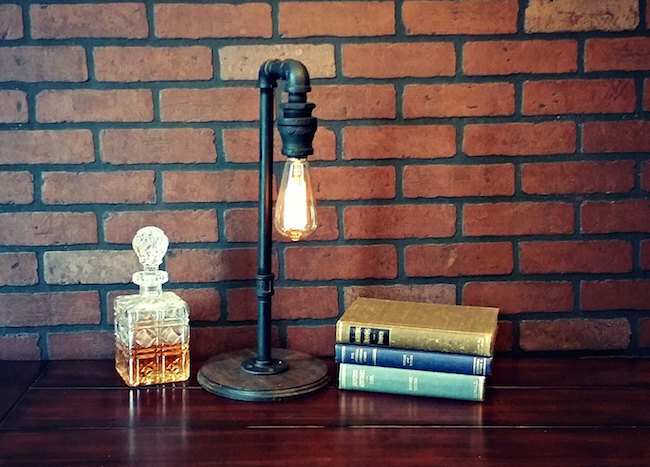 Of course, you’ll have to really like the look of Edison-style bulbs, pipes, and old machinery parts too, because that’s what these lamps are all about. 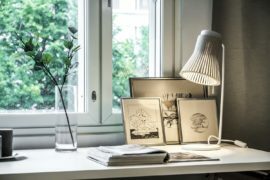 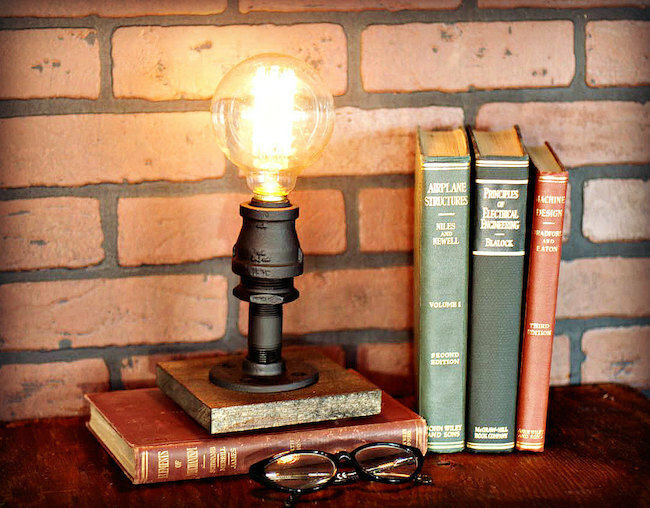 Whether you need to light up a side table in your living room, or study long into the night at your office desk, these unique and one-of-a-kind lamps will be sure to leave you feeling inspired. 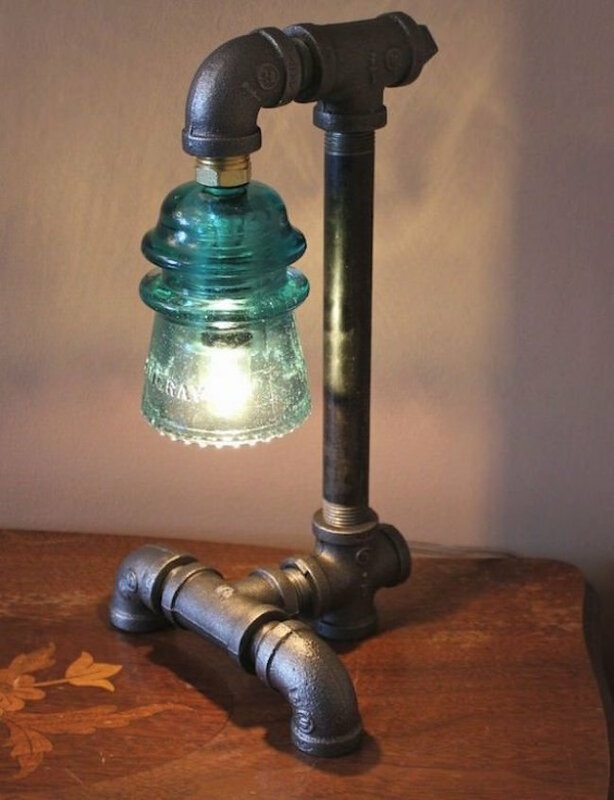 Nothing quite says industrial like some iron pipes, which is exactly what these table lamps have been made from. 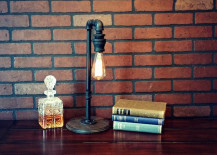 Illuminology on Etsy is just one of the many shops where you can find some seriously interesting looking lamps. 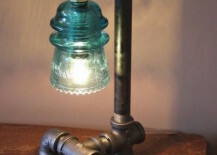 Recyclart featured one that makes use of an old green glass insulator. 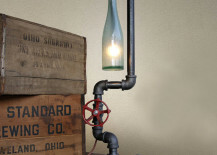 Here’s one from Fab.com that makes use of a pre-prohibition beer bottle and a vintage facuet handle. 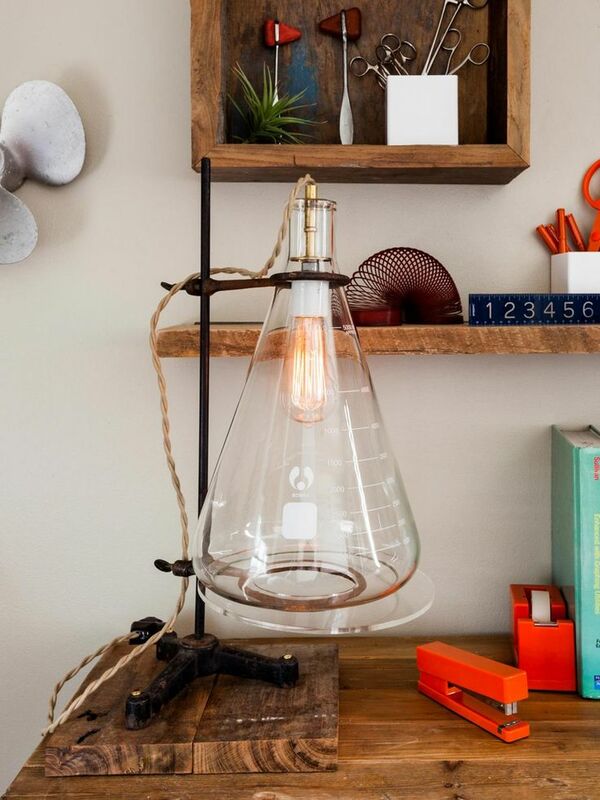 How’s that for a unique look?! 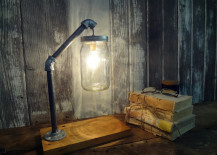 For those who are specifically looking for desk lamps, you have to check out the ones sold by MartyBelkDesigns on Etsy. 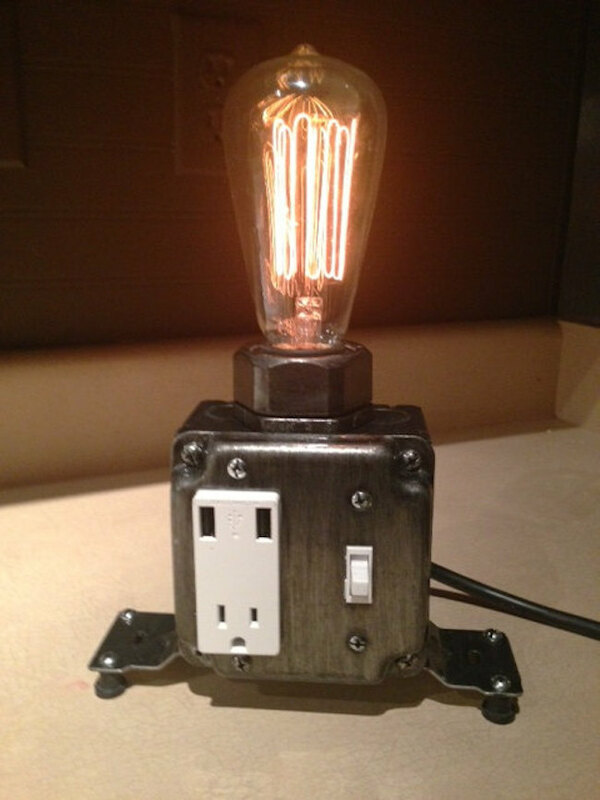 Not only do they have outlets for you to plug your laptop in, they also come with working USB ports too! 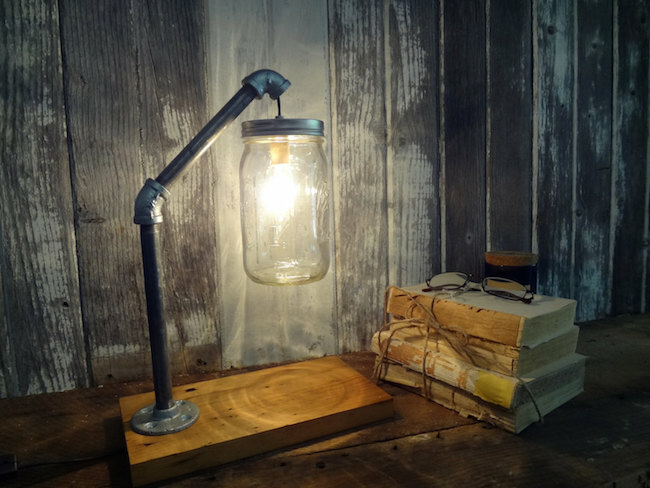 Similarly, HomeProsPlus on Etsy offers industrial desk lamps in other styles, which also come with convenient outlets and USB ports. 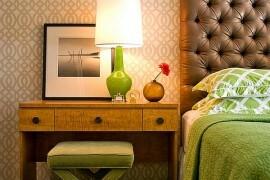 They also have handy wall switches built right into them. 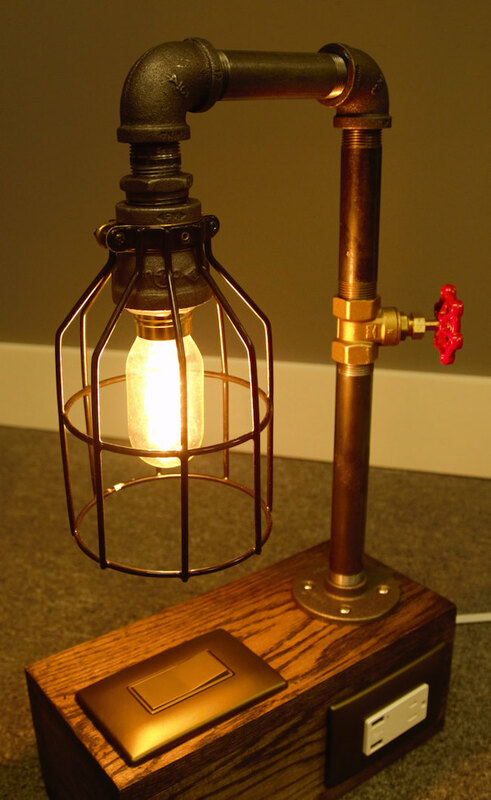 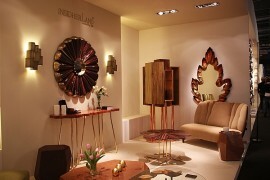 When it comes to the type of lamp that has a lamp shade, industrial design gets quite creative to reinvent the look. 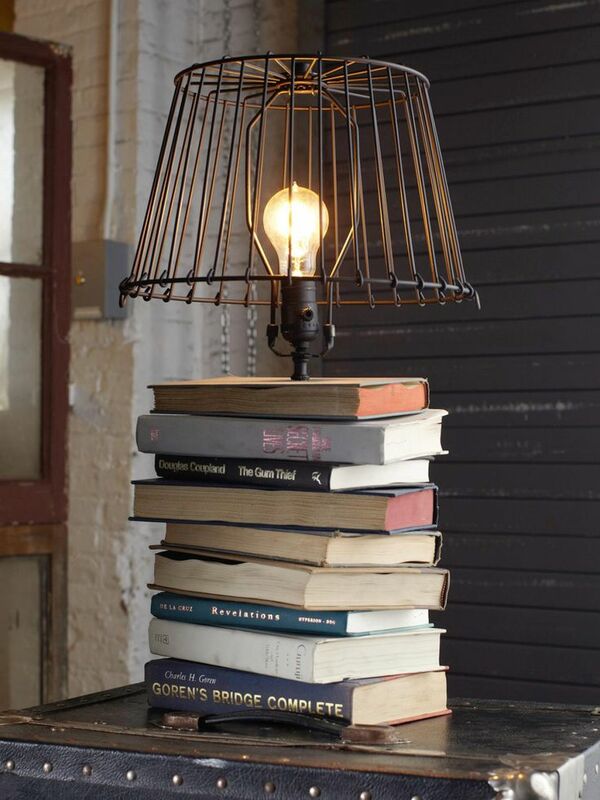 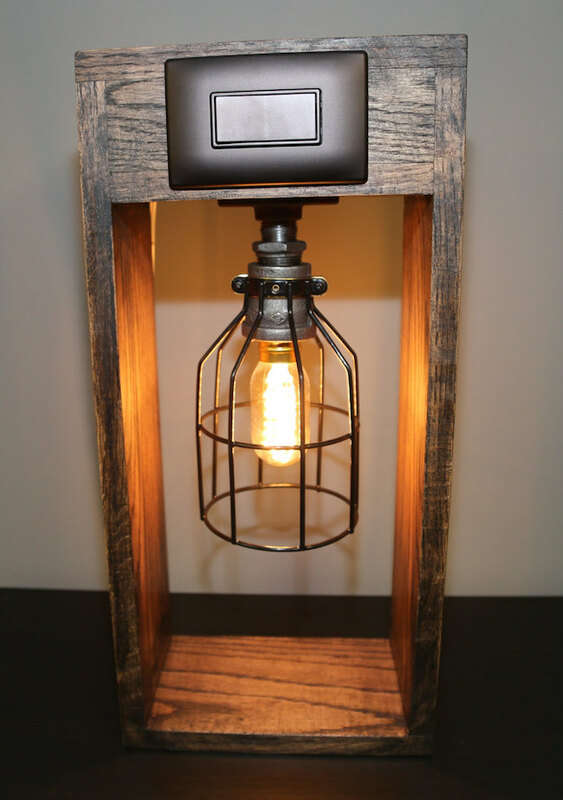 Check out this first lamp featured on DIY Network, which uses a wire shade and a stack of old books for the base. 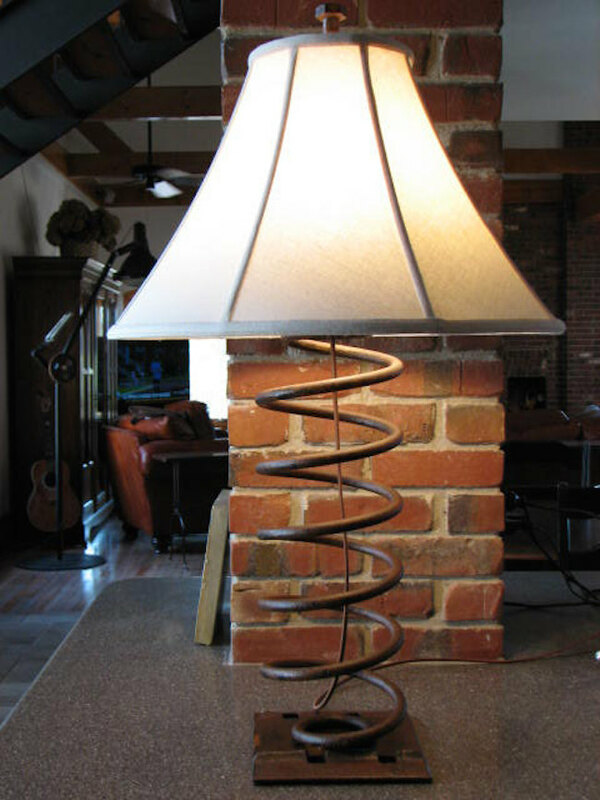 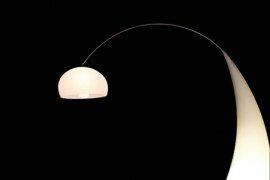 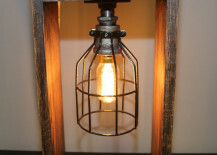 SnodonIron on Etsy showcases a lamp that has a traditional shade held up by an old truck spring. 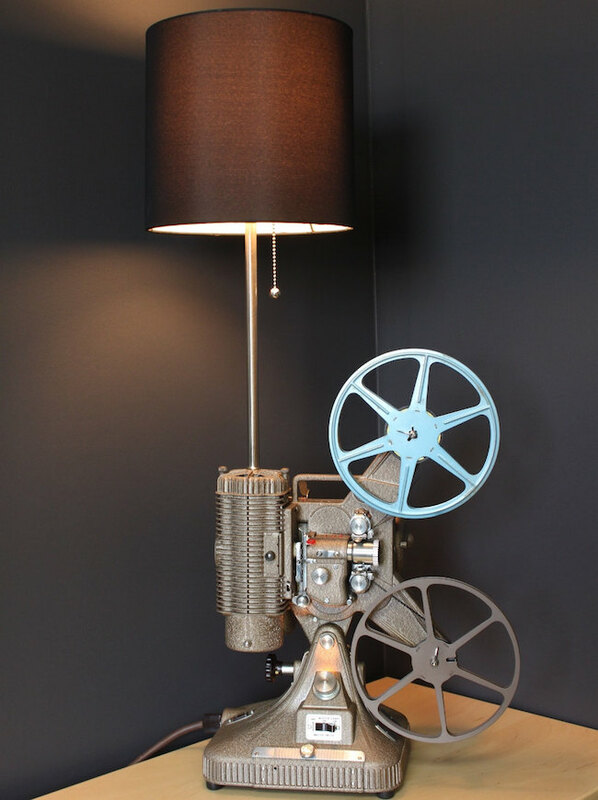 LightAndTimeArt on Etsy brings a new use to this vintage projector by using it as a very interesting looking base for this lamp. 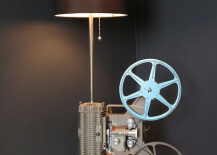 Like the old projector turned new lamp shown above, there are all sorts of other cool finds you can turn into lamps. 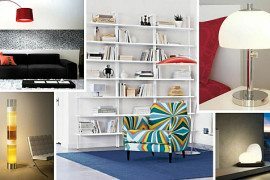 The possibilities are literally endless. 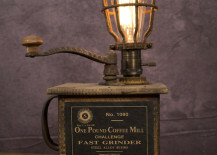 For instance, have a look at this vintage coffee grinder lamp from VintageLightCo on Etsy. 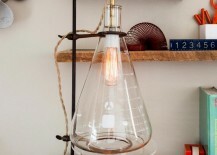 HGTV featured this genius idea of using an Edison bulb with a beaker for a dorm room desk lamp. 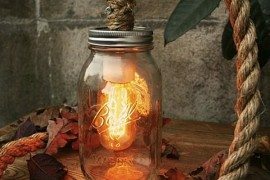 Or instead of a beaker, how about a mason jar? 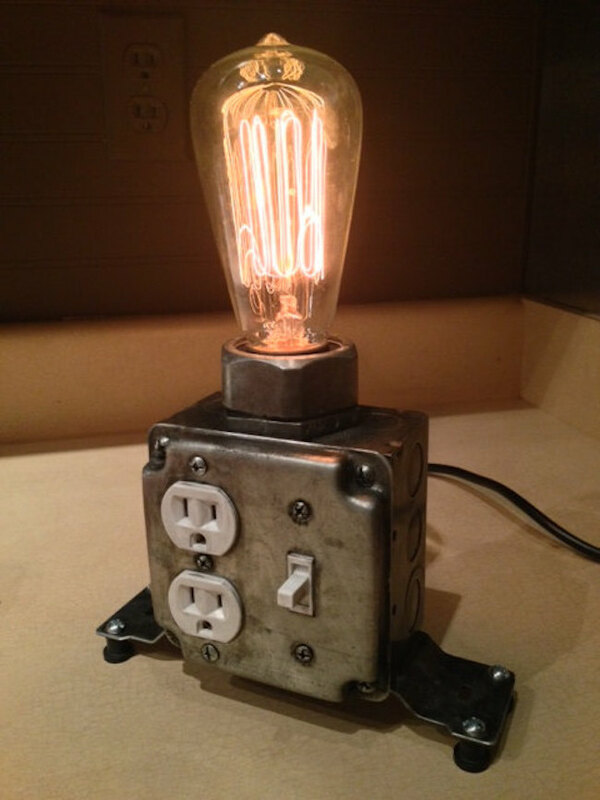 ThePinkToolBox on Etsy has them. 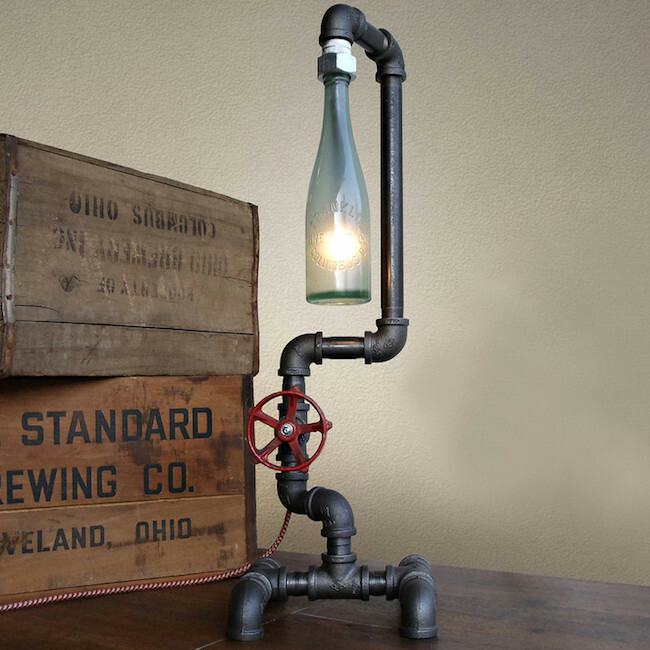 These incredible industrial lamp designs don’t just stop at one bulb. 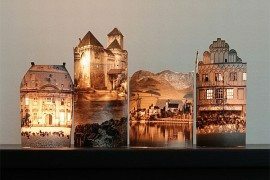 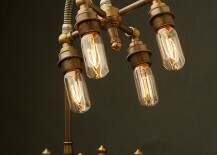 Because there are so many different and interesting parts that can be used to create these stunning works of art, multiple bulbs can go practically anywhere and still look amazing. 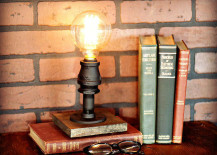 Check out this example from Edison Light Globes. 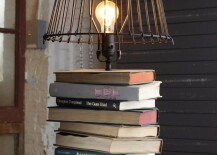 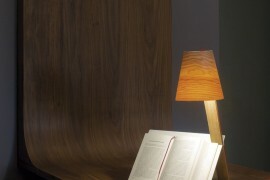 For a lamp that makes a serious statement, these certainly deliver!